Just popping in quickly today to share a card I made for the Daily Marker 30 Day challenge that I’m participating in this month. The 30 day challenge asks people who play along to color for at least 30 minutes a day and then share their results on social media using the hashtag #thedailymarker30day. You can read more about the challenge here. I’ve participated in almost all of the 30 day challenges now and I find that they really help me with my creativity – I try out mediums and color combinations I wouldn’t normally try, and there’s no pressure to turn the coloring into the card or to even get it right the first time. 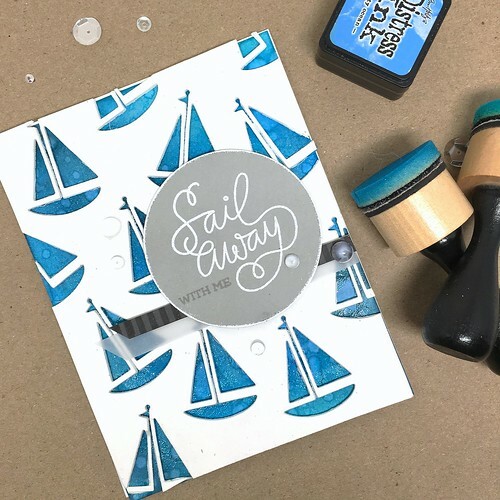 You can follow along with me over on instagram @kimberly.pelkey The design for this card was inspired by Yana Smakula, who makes beautiful cards (so definitely check out her blog)! 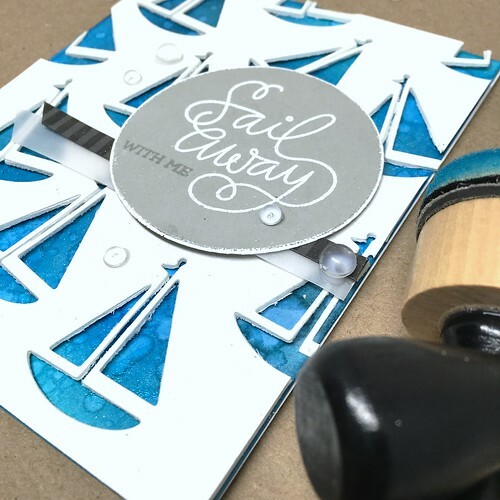 I used a sailboat die and the Sailing stamp set from Simon Says stamp to create the card. 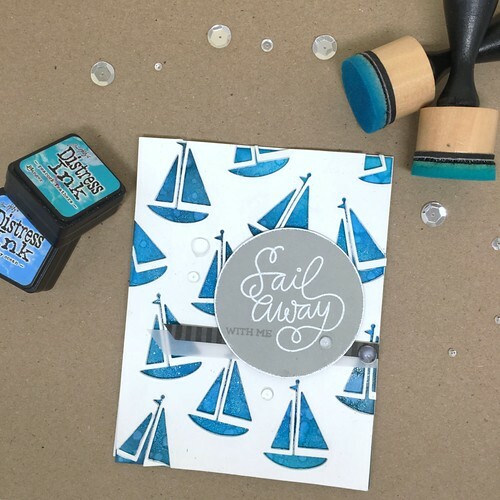 After die cutting a bunch bunch of sailboats from a white panel (that I adhered to some fun foam before die cutting to give the panel some extra dimension), I did some ink blending on another panel to go behind the cut outs. I used Salty Ocean and Peacock Feathers for the blending, then added some water droplets and glitter embossing powder over the top to give it some texture. 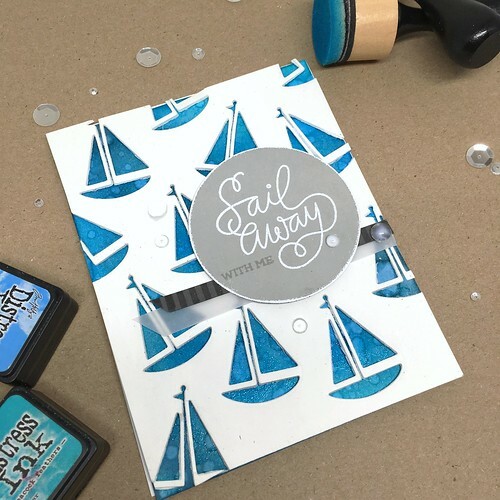 For the sentiment I used white embossing powder on “Sail Away” and then stamped “with me” in Versa Mark ink on some fog-colored card stock. I also added some strips of paper and vellum behind the sentiment circle and finished everything off with some clear droplets from Pretty Pink Posh. Are you participating in the challenge, too? Let me know so I can follow you!